"But I don't want to see the Recently Viewed list view first," said almost every Salesforce user I've trained. And I get that. Salesforce is incredibly customizable. Why isn't this an option? So I give them my standard pitch: "Recent items are things you're likely going to be in a lot, so hitting that list first will probably be efficient for you. Some believe it and agree. Others just swallow that bitter pill and move on. However, Salesforce has finally added a workaround for this. A way for you to default any list view as your primary, when you select that objects tab! Next, we'll select the List View that we want to see as our Default. For us, we'll use "All Open Leads." From here, we will go back to our Leads tab, click the little arrow drop down, and select the last option at the bottom "Open 'All Open Leads | Leads' in New Tab." But we want this tab to be more than temporary. We want this List View tab to be our main Leads tab going forward. So we'll add it to the Nav Bar. Select the drop down arrow next to All Open Leads | Leads, and select "Add 'All Open Leads | Leads" to Nav Bar." Your new tab is now ready for use! Let's take it a step further though, and customize the naming and reorder your tabs. Go all the way over to the right side of your tabs in the Nav Bar, and select the pencil. The pencil will take you to options to edit the Nav Bar and customize it for yourself. Don't worry, nothing that you do here will impact other users Nav Bar, just yours. This is where you can reorder your tabs, and edit the name of your new tab. For our purposes, we'll move our old Leads tab, and edit our new tab to be titled "All Leads." Rename your tab, then drag and drop it wherever you want it to be. I swapped our old Leads Tab with the new "All Leads" tab. 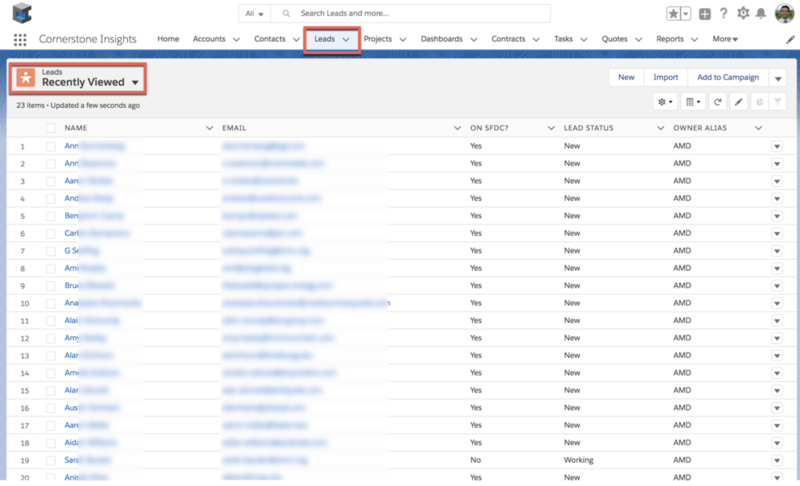 Save your changes, and enjoy your new default Leads List View! *Note: This new feature is only available on Salesforce Lightning. If you have questions about switching over to the new Lightning UI, please let us know.